The glaciated tops of the Himalayas are among the most hostile environments. Howling winds pierce the otherwise deathly silence as they add an intimidating score to the white monotony of ice. Yet scientists are now discovering that even in these inhospitable conditions exist pockets of unique biological and chemical organisms that might not only be having an impact on how systems with permanent ice and snow cover are changing, but could also indicate what kind of life could evolve in the ecosystems left behind by the melting glaciers. “Even in this environment, where nothing can survive, life has found a way,” says Parmanand Sharma, a scientist with the National Centre for Antarctic and Ocean Research (NCAOR), Goa, who found a crowd of shallow circular puddles of water as his team ascended the Sutri Dhaka glacier in Spiti’s Chandra basin. On closer inspection, the puddles rather resembled cylindrical holes—about 5-50 cm in diameter and up to 20 cm in depth—with dark brown sediments deposited at the bottom. “The sediment is actually mineral dust that has been carried here by the wind. They are alien to this place, but hold the basic building blocks for life. In the presence of sunlight and water, chemical and biological processes are powered in the dust and are leading to the evolution of life. So far, we have seen some unique microbes and invertebrates arising from these cryoconite holes,” informs Sharma. The word “cryoconite” is derived from the combination of two Greek words—“kryos” meaning ice and “konis” meaning dust. While cryoconite holes were first observed by ships traversing the edges of the Arctic circle in the 19th century, regular observations did not convert to academic interest till very late in the 20th century when exploration into the role of cryoconites in hydrological and biological cycles garnered some scientific attention. The veil first began to lift in the mid-1990s when research gave a peak into how dust particles actually transformed into a supporting medium for an ecosystem. Using samples collected from the Canadian Arctic researchers found that the dust particles are bound together by cyanobacteria. Building on this finding, scientists have shown how other microorganisms also get bound in these particles and act as active agents in building and maintaining the ecosystem, competing and coordinating with other inhabitants of the hole. A team of researchers from Poland, in fact, made the first attempt to catalogue the faunal diversity inhabiting these cryoconite holes in 2015. The research listed 25 species unique to these cryconites apart from a host of other bacteria, fungi and protozoans. The interest in cryoconites reached a tipping point after a period of record-breaking melting in poles, especially around the Arctic. It was confirmed in 2016 that the ice cover around the Arctic circle had been undergoing accelerated rates of melting, much higher than what had been projected. The culprit was identified to be these mini-ecosystems that had pockmarked large areas of the glaciated pole along with dark-hued algae that were binding themselves to the ice. Scientists now realise that the cumulative effect of these cryoconite holes is no longer negligible. An experiment in Svalbard glaciers in the Arctic showed that an increase in the dust particles had caused a thinning over a large area, spelling trouble for the Arctic ice cover which could contribute to up to 7 m sea level rise. 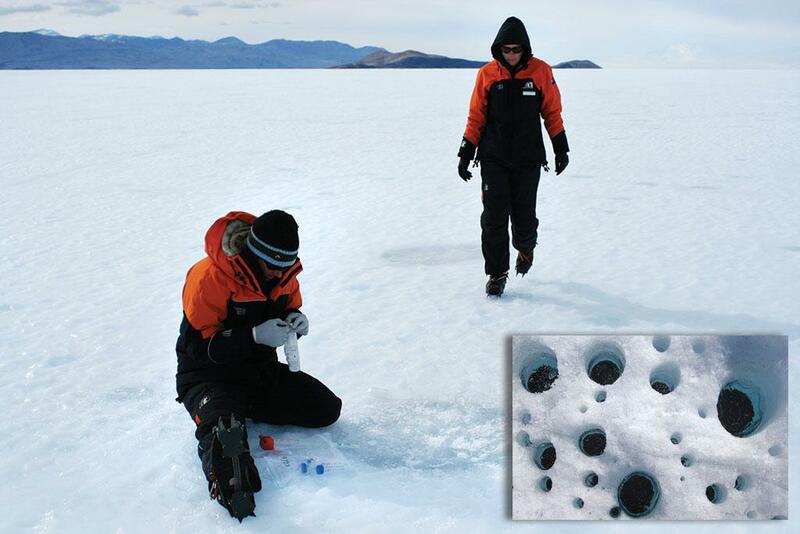 It is estimated that anywhere between 3-16 per cent of the polar ice and snow could be covered by cryconite holes. Globally, cryoconite holes are estimated to cover over 23,000 sq km across the world. Alien dust carried and deposited on the glacier surfaces by winds absorb more solar radiation owing to their darker colour. While ice and snow cover on glaciers typically reflect about 60 per cent of solar radiation, this drops to 20 per cent when the surface is pockmarked with cryoconite holes. The higher absorption of solar radiation results in the melting of water around the dust and the formation of the circular or ovular pockets. Beyond this, the mineral dust forms the basis of nutrition in the cryoconite ecosystem. This can support a host of invertebrate life, and mircrobes are at the top of the cryoconite foodchain, which is seldom seen outside glaciers. These microbes are being studied for their anti-freeze properties and their ability to survive in space. But while these unique glacial micro-ecosystems are fascinating, they might also be contributing to the problem of accelerated glacier melting. Studies from the Arctic and Antarctic regions suggest that cryoconites are, in fact, being influenced by a positive feedback loop of global warming. While higher temperatures have spurred microbial activity, the microbial activity seems to be intensifying glacial melt. Such probing is only now beginning in the Himalayas, mainly through observations collected by the NCAOR team working in the Chandra basin. “We are now involved in novel research regarding cryoconites. For the first time, an indigenous effort has been undertaken to understand this phenomenon and its biological, chemical and geological implications,” says Sharma, adding that cryoconites are responsible for about one per cent of the glacial melt in the Sutri Dhaka glacier. The cyanobacteria responsible for the formation of granules are photosynthetic and thus use atmospheric carbon dioxide (CO2) to produce energy, thus acting as a sink for carbon. A team from the University of Bristol estimated that cryconite holes cumulatively remove about 63,000 tonnes of CO2 from the atmosphere. However, this ameliorating impact on global warming is far from constant in cryoconites. On ice sheets that are less stable, where the fine layering of cryoconite dust is not possible, CO2 consumption is exceeded by the emission of greenhouse gases by other microbes, effectively converting cryoconites into a source. “I don’t know if cryoconites will be the basis of any future ecosystem, but knowing them better will undoubtedly help humans in tackling many critical challenges,” adds Sharma. (This story was first published in the 16-30 April issue of Down To Earth).